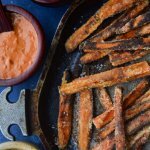 These Crispy Baked Sweet Potato Fries with Dipping Sauces have a wonderful crunch when you bite into them. Sprinkled with coarse sea salt and dipped in one of three sauces make this a delectable side dish or an afternoon snack. The secret ingredient to is crispiness is a coating of cornstarch before you fry them. I love, with all my heart, a golden, crispy, hot french fried potato. I wish I could kiss whoever came up with the idea to take a brown rugged root vegetable from the earth, slice it into perfectly long strips, dunk it into a pool of scalding hot grease, and then douse them with loads of salt. In my book, this genius should go down in history as the ultimate recipe developer. How simple, but how profoundly innovative. If only they were good and healthy for you! Ugh! This is the dilemma of the ages, well maybe not the ages, but definitely in my little world. But then … along comes, a lovely orange beauty called the sweet potato! Who would’ve ever guessed? What an amazing array of things you can do with this delectable vegetable: sweet potato pie, sweet potato hash, sweet potato pancakes/waffles, sweet potato bisque. It seems these days, you can put a sweet potato into just about anything and make it work. 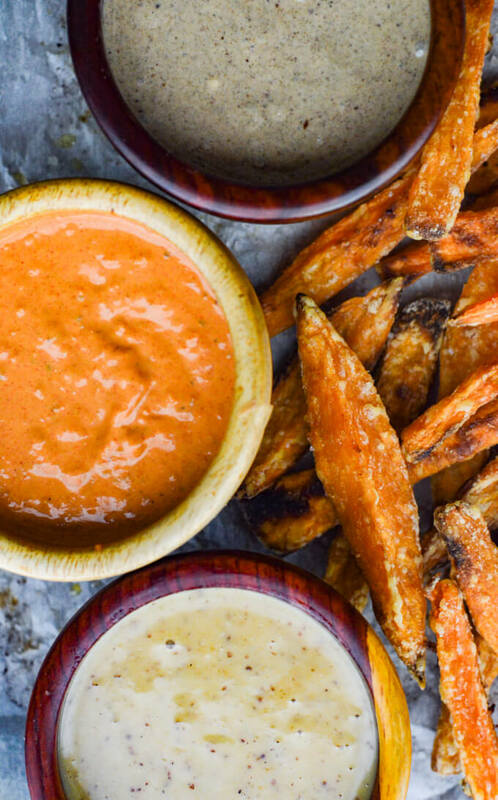 But the recipe above all recipes (for the sweet potato, that is) taking center stage is (drum roll please) Crispy Baked Sweet Potato Fries with Dipping Sauces. The last thing a sweet potato wants to grow up to become is a flimsy strip of mush. What an embarrassment, a complete disgrace to every potato on the planet. Oh, the horror! But take heart. We can do our part in the world of “sweet potatoes.” We can help them find their true destiny and calling which is to become a “Crispy, Crunchy Delicacy.” There are a few extra steps involved, but in the end, it is so worth the effort. And your sweet potatoes will be forever grateful. Big is not always better, especially when it comes to crispy fries. Be careful to not cut the strips more that 1/4×1/4 inch thick or they will not crisp up well. Throw the sweet potato strips into a bowl of water and let them sit in the refrigerator for at least an hour. This process pulls the starch from the potato which helps them crisp up much better. When ready to bake, remove the sweet potatoes from the water, and dry them on paper towels. 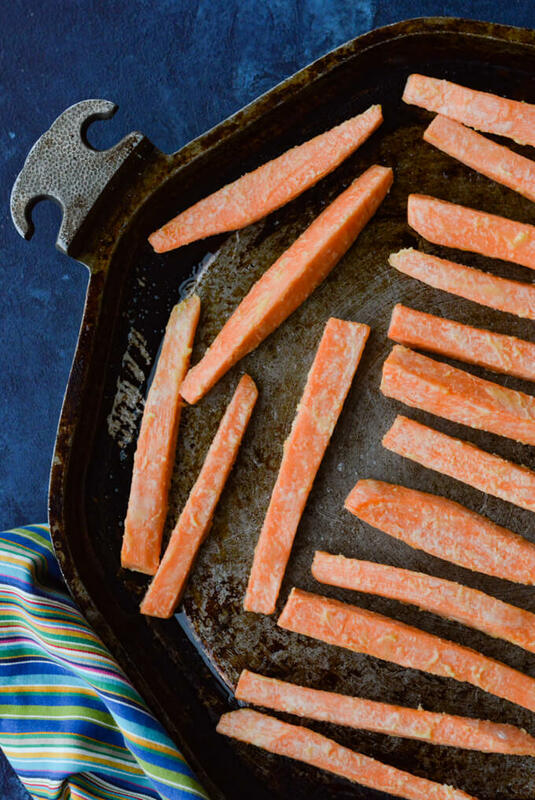 You’ll probably be surprised, but the secret ingredient to making your baked sweet potatoes fries really crispy is coating them with a starch. This could be cornstarch, tapioca starch, or potato starch. Put your dried strips of sweet potatoes into a large ziplock bag and add enough starch to lightly dust them. Shake until every piece has starch on it. Be careful to not use too much oil. After coating the sweet potatoes with starch, place them into a large bowl and add a small amount of olive oil and smear it on all of the potatoes, just enough to coat over the starch. Don’t overcrowd the pan. Line your cookie sheet with parchment paper and spray it with a light coating of cooking spray. 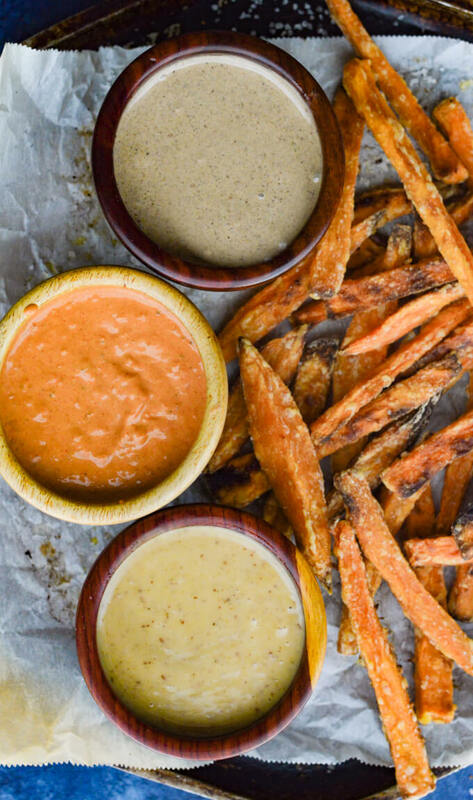 You do not want the sweet potato fries to steam, therefore leave room between each of them. When the fries are done, turn off the oven, open the door about halfway and let them sit for 10 minutes. Do not salt your fries before baking them. Salt draws moisture out during the cooking process and will leave your fries somewhat soggy. Therefore wait until after you bring them out of the oven to add salt. 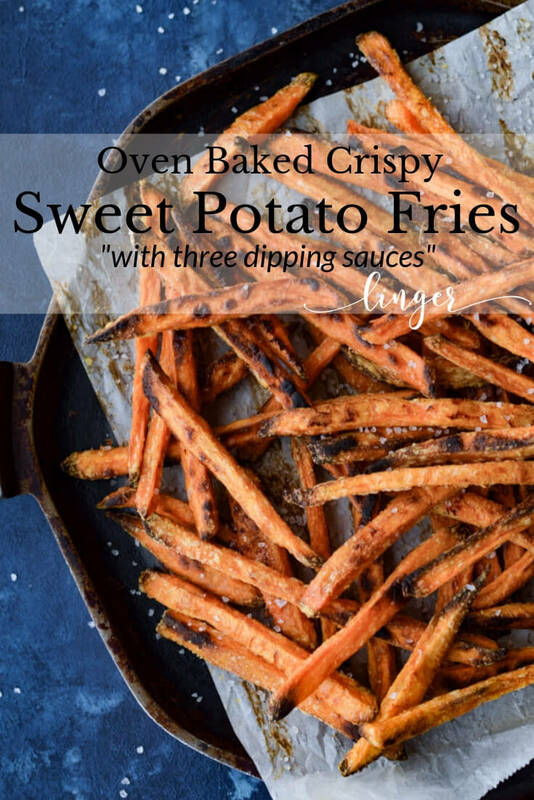 The baked sweet potato fries are a healthy alternative to the french fried potatoes that we all love and adore. Unless, of course, you eat a whole batch in one sitting. Okay, I have to admit that I’ve done this a time or two. Concerning dipping sauces for these crispy delights. For full disclosure, there is nothing healthy or light about them. But every once in a while it’s good to throw caution to the wind and indulge. I have included three sauces in the recipe below. Each is very different from the other. But they all go great with the sweet potato fries. 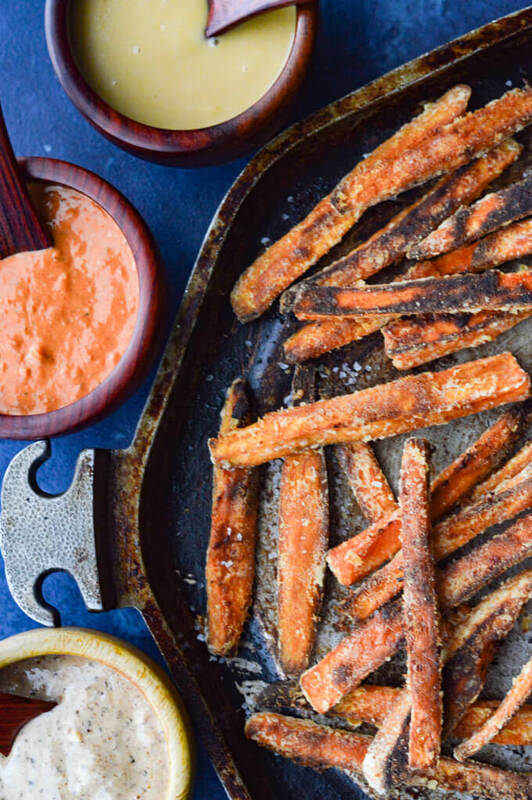 These baked sweet potato fries are perfectly crisp. Sprinkled with coarse sea salt and dipped in one of three sauces make this a delectable side dish or an afternoon snack. Wash, rinse and peel the Sweet Potatoes. Cut them into long strips about 1/4×1/4 inch wide. Place the sweet potatoes in a large bowl of water and let sit in the refrigerator at least one hour. You can let them sit overnight as well. When ready to bake, preheat the oven to 425, remove the sweet potatoes from the water and dry on paper towels. Place the sweet potatoes in a jumbo ziplock bag and sprinkle 4 teaspoons of cornstarch over them. Seal and shake the bag until all the potatoes have a nice light coat on them. You could use a large ziplock bag and divide into 2 batches. Place the strips in a large bowl and add 2 tablespoons of olive oil. Lightly smear the oil all over the sweet potatoes. Cover two large cookie sheets with parchment paper and lightly spray the sheets with cooking spray. Place the sweet potato strips in a single layer on the cookie sheet without touching each other. Bake for 15-20 minutes. 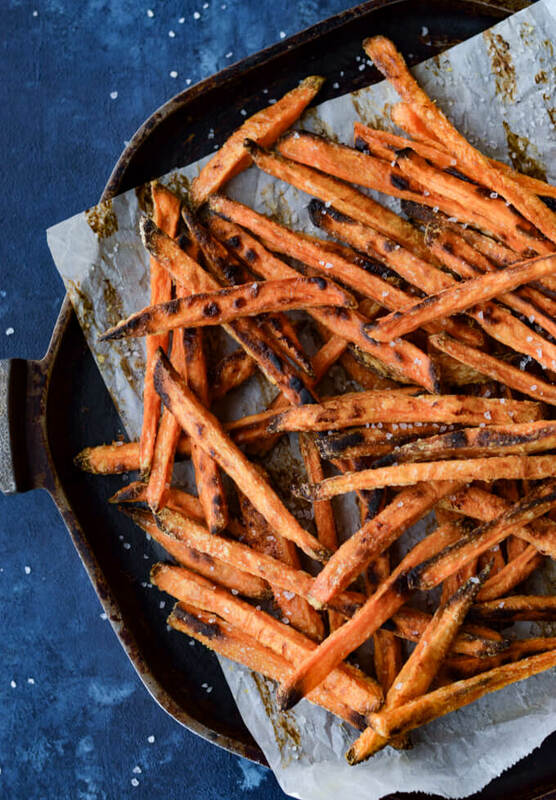 Carefully turn the sweet potato fries over and bake for another 15-20 minutes until they are nicely brown on both sides. When they are done, turn the oven off and open the door halfway and let the cookie sheets sit in the oven for 10 minutes. Sprinkle with coarse sea salt. Serve with dipping sauces is an option. Thread large marshmallows on wooden skewers. Place skewers on a wire rack over a cookie sheet and place under the broiler in the top of the oven and broil for 2-3 minutes until charred and bubbly. Let cool slightly. Carefully remove the marshmallows and combine in a medium bowl with cinnamon, and nutmeg. Add 1/4-1/3 cup whipping cream to desired consistency. Beat until smooth. You will see specks of the toasted marshmallows in the sauce. Serve semi-warm. Combine all the ingredients in a small food processor and blend until smooth. Keep refrigerated. Preheat oven to 350 degrees F. Cut tomatoes lengthwise and arrange on shallow pan cut side up. Cut the red onion into 2-inch chunks and add them to the pan along with garlic cloves with skins still on. Drizzle olive oil over the vegetables and sprinkle generously with salt and freshly ground pepper. Add the sprigs of thyme over the top of the vegetables. Cook in the oven for 1 hour or until tomato skins are wrinkled and the vegetables are soft. Let cool. Squeeze the soft garlic out of its skin. In a food processor, blend the roasted vegetables, mayonnaise, paprika, cumin, hot pepper sauce and the cooking sherry. Process the mixture until smooth scraping the sides in between pulses. Season with salt and freshly ground pepper to taste. Cover and refrigerate at least 30 minutes or overnight for all the flavors to meld together. WOW ! ! Kristy, those secret tips worked their magic! I followed the recipe to the tee and they were fantastic Thank you for a yummy treat and the sauces were the icing on the tatters! Carol, you’re so sweet to share your experience with this recipe. I’m glad you enjoyed these little crispy treats! And I agree, the sauces are the “icing on the taters.” hahaha! Thanks so much Niki. The fries are really good, but the dipping sauces are what makes them great! 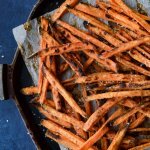 Love me some good and crispy sweet potato fries! These look great. Thanks so much Priya for stopping by! These are my downfall. I can eat the whole pan by myself.